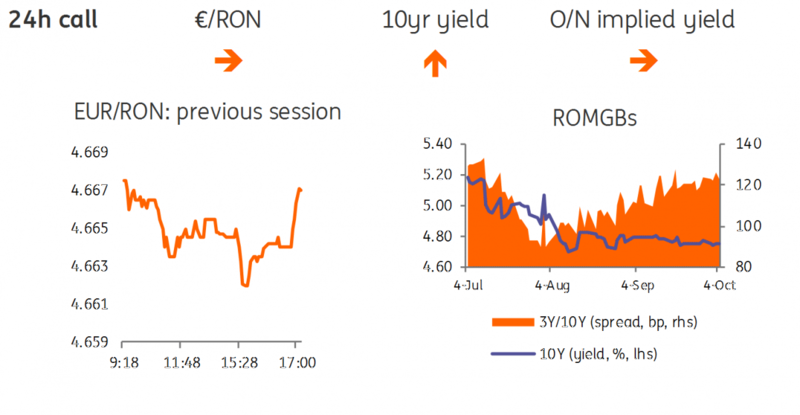 The EUR/RON closed flat yesterday, around 4.6670, despite somewhat higher intraday volatility. The NBR Governor's press briefing following the Board meeting didn’t bring much news. The central bank is still vigilant on exchange rate developments and we believe that FX stability will be the main driver of interest rate decisions, particularly if depreciation pressure on the leu intensifies. Today we look for the same 4.6600-4.6700 range. Today the MinFin plans to sell RON300 million in a 6-month T-Bill auction. The shorter dates haven’t been that popular lately given the liquidity deficit and repo-dependant money market, but due to the small amount, the MinFin should not have problems meeting its target. 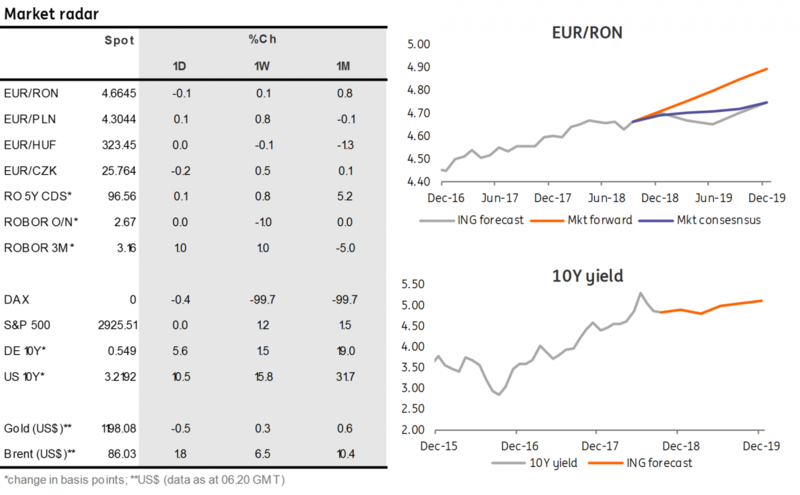 We expect the average yield to come in around 3.25%, slightly below the FX swap implied yields. Clustered demand will likely be appealing to MinFin and an upsize should not be ruled out. Otherwise, US Treasuries surging to levels last seen back in 2011 could translate into upside pressure on the ROMGBs curve. Money market yields covering the current reserve period dropped another 5-10 basis points and are now trading around 2.60% as liquidity injections work their way into interest rates. Nevertheless, we tend to believe that it is not yet game over for the current reserve period as the Romanian leu has been under some depreciation pressure lately while MinFin’s possible auction upsizes could still distort the liquidity picture. At yesterday’s press briefing, Governor Mugur Isarescu referred to a possible cut in minimum reserve requirements (MRR) for local currency. It seems however that the NBR is reluctant to create a structural liquidity surplus which could ignite further depreciation pressure on the Romanian leu. Combined with a less benign inflation backdrop, this leads us to believe that a potential cut in RON MRR is rather distant.